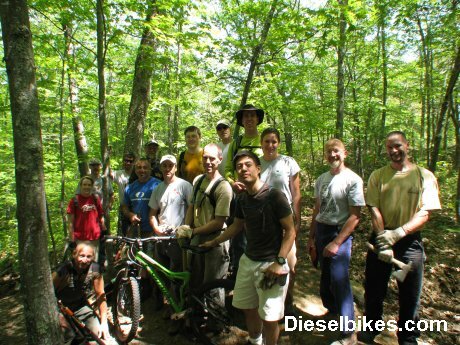 This page contains all trail maintenance projects held by Dieselbikes related to Bruce & Tom's. The first section below contains information regarding the most recent trail day completed. Further down the page you will find other trail projects sorted by date and year completed. On Sunday June 07 the second 2009 Tompson Reservation trail project was completed. It was a perfect day for trail work and we had a good turn-out of volunteers to help complete this project. Our goal was to refurbish a section of trail locater near the old barn drop and move it to more sustainable ground making it fun for all. We are happy to say that 100% of this trail project was completed. A section of the yellow trail that passes through the ramp-o-rama playground area works its way down a hillside toward the old (now gone) barn drop. As the original trail passes near the barn drop running through a low-lying area that became flooded with sections staying wet most of the season. We focused on closing the low-lying section of trail and cut a new more sustainable line that runs on higher ground. This new trail connector begins at the base of the old barn drop and connects to the end of the new trail cut last October 2008 (trail day link). The new trail contains a small skinny bridge to cross a stream, multiple rock rollers and plenty of other technical features that any level of riders will enjoy. This was is a good size trail project and a combined effort between Essex County Greenbelt, Dieselbikes, Sinister Bikes and North Shore NEMBA. I want to extend my personal thanks to each individual (listed below) that helped complete this project. The amount of work completed by the volunteers was backbreaking. I look forward to see everyone again in future trail builds and or maintenance projects.